I Know. Yet Another Post About the New Year. But This One's Brought to You by the Car Talk Boys! 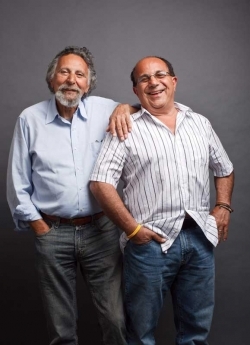 If you know me at all, it could come as a surprise that I'm a huge fan of Tom and Ray, the NPR Car Talk boys. (If you ever want to know how to do a Website bio right, read theirs here.) I don't do electronics. Is a car an electronic? I've no idea. Anyway, while we respect and appreciate each other, technical things and I avoid any deeper relationship. I don't want to know how they tick any more than they want to know about me. But Tom and Ray (or Click and Clack, as they call themselves) are adorable and funny and charming and very Massachusetts-y. So, when folks call in with car troubles, I sift through the gear and shaft and oil and cylinder talk for the good stuff and the reason people REALLY listen: they're just so darn fun. "...He told us this whole story about how he drove his old Chevrolet from Minnesota to Alaska. The car had 350,000 miles on it, and he'd made a major repair using a barbeque grill. He wanted to know if he should drive the car home. We told him, "Go for it." Some of our best calls are from people who are trying to go on some kind of adventure and need encouragement. A lot of people lead predictable lives and don't take any risks. But if you don't, then you won't have any stories to tell your kids. You don't want to do something that's going to end your life, but it's good to do stuff where things can go wrong. If something happens, and it creates an adventure, you'll remember it forever. I remember one guy who was going to take a trip with his father and brother. They were going to drive some old Dodge Dart or some other old clunker. Doug [Berman, the producer] was in our headphones suggesting that we tell these guys to rent a newer car. I said no. The best thing that can happen is you break down every hundred miles and you get into arguments and everything goes wrong. It'll be the greatest trip you ever took." Gretchen Rubin of the Happiness Project likes to have a one-word theme for each year. How simple and to the point. I like that pretty fine, so about a week ago, I came up with mine for 2011: ME. Yup, Me. I do know that this sounds horribly selfish, but we'll just have to live with that for a year. After that, it will be YOU. Seriously and I mean it. YOU. And maybe, if there's time left, a good cause or two. This past week, I organized ME into specific categories and goals as suggested by Chris Guillebeau of the Art of Nonconformity and I developed a workable timeline which I divided into quarters. Then today, I spotted Ray and Tom's interview on my desk. They're so right about what makes for the best times in life and the best memories when we have to look back upon it. And adventure does fit right into my ME theme (into the theme, but not quite yet into the non-willy-nilly gal that is me). So, how to have both? A year's worth of specifics while having a year's worth of adventures? I've really no idea, but I think I'm going to have a plan and a non-plan. To kick that off, for example, I've looked up the definitions of fun and spontaneity, and I've just scheduled a trip without a play-by-play itinerary. (Dear God, typing that sentence just gave me a hive.) If all this means I get lost or stuck on a road in the middle of nowhere, then so be it and lucky ME!! Right? Yea. Must remember to breathe. And tape iPhone charger to body. ME is clearly a work in progress.